Want to get started in paddle sports? Learn more about stand up paddle boarding, or SUP, including the benefits and how to get started. 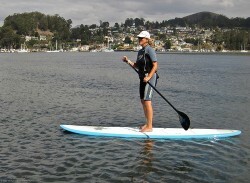 Stand up paddle boarding, or SUP, can be described as walking on water. This is one of many paddle sports to originate in Hawaii and has picked up in popularity over the last decade thanks in part to Laird Hamilton, a prominent stand up paddle surfer. The sport uses a longboard combined with a long-handled paddle to glide over the surface of the water. Stand up paddling can be done in any type of water, which is just one of the advantages to this versatile and exciting sport. Whether you want to explore a calm nearby lake or hit the waves, SUP may be the sport for you. There are many benefits to stand up paddle boarding, including the fitness aspect. Simply carrying your board to the water is a workout, as some boards can be very heavy. Of course, inflatable stand up paddle boards weigh only a few pounds and inflate on the beach, so there isn't this aspect if you chose an iSUP. As you paddle, you get a full-body workout that engages your core muscles, legs and arms. It's also a cardio workout if you take a long paddle or go into rougher waters and catch waves. Of course, this isn't where the benefits end. Hitting the water on a paddle board can help you release all of the stress from a long week and get in touch with nature. As you explore local bodies of water, you'll probably run across wildlife from manatees and dolphins to turtles, beavers and moose. The water is such a relaxing and calming environment, so many people even paddle to a secluded area and practice yoga on their boards. There are many yoga paddle boarding classes throughout the country that help you get in touch with friends. Finally, paddle boarding is appropriate for all ages and levels of experience. If you've never tried paddle sports before, SUP may be a good way to get started. You can even bring the kids along and get them a paddle and board designed for younger people. Even dogs are welcome to come along! You'll need a few pieces of gear to get started, including a stand up paddle board, paddle, a PFD, sun protection and proper clothing to fit your environment. The type of paddle you choose depends on your size, paddling style and the type of water you're going into. Inflatable stand up paddle boards are a great choice for beginners, as they're easier to learn with as far as balancing and maneuvering goes. It's best to learn on calm water with no obstacles like other watercraft. To mount your board, stand alongside of it and put your paddle across the deck. Hold onto the board by the rails and pop on in a kneeling position just a few inches behind the center. In this kneeling position, you can feel the balance of the board and raise slowly. The nose of your SUP board should not pop out of the water and the back, or tail, of the board shouldn't be digging into the water. If you want to take lessons to get started or want to rent equipment first, try finding local SUP clubs in your city. Florida and California have thriving SUP communities, although they can be found across the country. Where Can You Paddle Board? Virtually any body of water is suitable for paddle boarding, including lakes, lazy rivers, the open ocean and marinas. Some people into an extreme version of the sport even take their boards into whitewater rivers! You can even set up your SUP board in your pool if you want a relaxing environment to practice yoga. This article explains more about Yoga SUP and ways to get started. An article from ThatsFit.com citing a recent study and some tips to get started. An excellent resource for information on all kinds of paddle sports, including SUP, kayaking and canoeing.